Can I Sue a Car Company if My Airbags Don’t Deploy? Companies that manufacture vehicles are required to use reasonable care when designing and assembling their products. Failing to do so can have serious and even deadly consequences for a car’s occupants who may suffer painful and debilitating injuries as a result. This is doubly true for airbags, which are specifically designed to inflate rapidly upon impact and prevent occupants from striking interior objects. 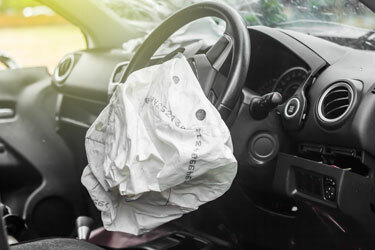 When airbags fail to deploy, it puts both drivers and passengers at risk of sustaining devastating injuries. Fortunately, both airbag manufacturers and vehicle manufacturers can be required to compensate injured parties for their losses. Airbags are specially designed to deploy when a vehicle decelerates at a rapid speed. In most cases, airbag systems will only deploy if a car has reached certain speeds, which helps prevent airbags from deploying (and causing injuries) in minor collisions. However, when the impact sensor system perceives a moderate to severe crash, the airbag system’s electronic control unit will send a signal to the inflator located within the airbag module. This then causes an igniter inside the inflator to start a chemical reaction that produces a gas, which inflates the airbag within 1/20th of a second. Generally, side-impact airbags inflate even more quickly. Unfortunately, because so many parts must be in working order before an airbag will properly deploy, even a minor defect can compromise the whole system, leaving a car’s occupants with little to no protection. When these types of problems can be traced to a manufacturer’s failure to test a product, to assemble it appropriately, or to a blatant disregard for test results, a number of different companies in the chain of supply could be held accountable for resulting losses. This could include the car’s manufacturer as well as the designer or manufacturer of the airbag. Injured parties who can demonstrate that the defect was unreasonably dangerous and caused their injuries may be able to collect damages for medical expenses, lost wages, loss of future income, and pain and suffering. Please contact Sutliff & Stout by calling or texting 281-853-8446 today to set up a free one-on-one consultation with an experienced product liability attorney. A member of our legal team can also be reached via email. We are eager to help you throughout each step of your case.